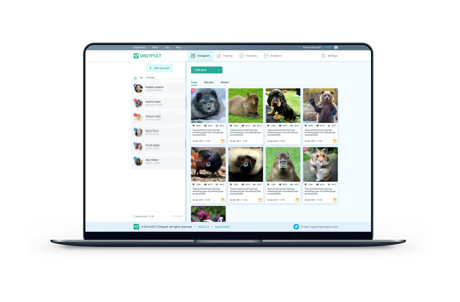 Onlypult is a set of tools for Instagram that allows you to manage multiple accounts, post photos and videos to Instagram instantly and in the desired date and time. With Onlypult you can also work with comments. A possibility especially for large teams was created to invite your colleagues to manage the account and post messages and comments without granting access to the Instagram profile. For those who don’t want to use third-party photo editors before the publication, a function of resizing the images and using more than 10 filters in the service was created. The most popular tags in 19 categories that you can select with one click were picked to help attract attention to your publications. And for fans of sharing the emotions we have built in the world famous emoji smileys. We are constantly developing Onlypult and adding new features to make our service better and more convenient for Social Media.